One of the things I enjoy most is shopping online. I love how I can get anything I want with a single click of a mouse. I don't have to worry about long queues at the check out counter, creepy sales ladies stalking my every move or finding a good parking space. Shopping online is quick and easy. It provides you with the description, size and color availability of the item you want so you need not wait for the sales lady to go and check the stockroom. The World Wide Web never closes so you can shop anytime and anywhere you want. I've been recently browsing the pages of ZALORA and I'm glad that they now carry a lot of local and international brands. I was checking their Swimwear category and found one of my personal favorites, Wanderlust. I've always been a fan of their products so I knew I had to get something from their Holiday collection. I decided to buy this vintage-inspired high-waisted swimsuit in white. I really love the 1940's pin-up girl vibe. Hours after I placed my order, I got a call from a ZALORA representative confirming my order and my mailing address. Talk about customer service! Not only do they offer a wide range of payment options, from credit cards to G-cash, Paypal, bank deposits, and for Metro Manila residents, cash on delivery, they also offer FREE shipping and FREE returns within 30 days. With their own fleet of couriers, or "Z Riders" for the Metro Manila area, delivery time is around 3 hours. Nationwide, it is 1-2 days. This is by far one of my best online shopping experiences! So instead of heading to the mall, pay a visit to ZALORA's website and start shopping. 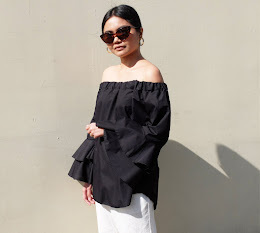 As a special treat for my readers, you can get an extra 5% discount on any ZALORA order by using the voucher code AlexaMartin12K upon check out for every minimum purchase of P500.